With the growing age of baby boomers and new healthcare initiatives, a greater need for registered nurses is imminent in the potential future. As one of the fastest growing occupations in the country, hospitals need higher-educated nurses who can be leaders in the healthcare industry. As a result, online MSN programs are now readily accessible to any nurse seeking to further their nursing career. Many benefits of an accredited online MSN degree revolve around the idea that nurses don’t have to visit campus so they can focus on family and employment while earning their degree. Also, graduates of online MSN programs have a greater range of job possibilities and a greater earning potential in the workforce. Masters-degree nurses have more options to pursue as well, whether that is in administration, clinical nurse management, or seeking a doctorate. Johns Hopkins School of Nursing is widely recognized with top rankings from U.S. News & World Report, QS World University Rankings, College Choice, Mometrix, National Research Council and others. Most MSN programs online require a two-year commitment and current nursing registration. Nurses can specialize in areas like clinical leadership or healthcare administration programs. Also, some schools offer an accelerated BSN program which is typically for students with a non-nursing bachelor’s degree. *Graduation rates listed are based on the overall undergraduate graduation rate of the school and are gathered from the National Center for Education Statistics (NCES). To find more information about a specific MSN program’s graduation rate, please contact the appropriate school. The University of Central Florida provides students with an MSN degree program with three different tracks: Leadership and Management, Nursing and Healthcare Simulation, and Nurse Educator. The MSN nursing program at UCF is designed for students with a BSN and professional experience. Students with a bachelor’s degree in a major other than nursing can still be admitted with pre-requisites. Graduates of the program will be prepared to assume leadership positions as administrators and educators in a variety of healthcare settings. James Madison University, located in Harrisonburg, Virginia, is a public institution where all of the graduate-level students have access to the online MSN programs. The Nursing Administrator concentration is a 32-credit online program with rolling admissions. The programs begin at the same time as regular school semesters with a face-to-face orientation that occurs at the beginning of each semester. The University of North Carolina at Charlotte is a public research university located on a 1,000-acre campus. Over 29,000 students are enrolled at UNC Charlotte, about 5,000 of whom are graduate students. The Master of Science in Nursing program offers online programs in Community Public Health Nursing, Nurse Administrator, and Nurse Educator. Online nursing degrees at UNC Charlotte require a Certified Nursing License. Each program requires around 36-39 credit hours and can be completed part-time in 27-36 months. The university also offers an accelerated RN-BSN for undergraduate students. Herzing University, located in Menomonee Falls, Wisconsin, is a private institution with eight different locations around the United States. HU has most of their programs available online, including the Master of Science in Nursing. HU offers degrees specializing in Family Nurse Practitioner and Nurse Educator for the MSN. Also, HU provides the RN-BSN for non-major nurses. Either course takes about 16-20 months to complete. Florida State University, located in Tallahassee, Florida, offers more than 300-degree programs at the undergraduate, graduate, professional, and specialist levels. The Florida based institution serves over 40,000 students each year. Florida State’s online master’s nursing program offers a Masters of Science in Nursing for students living in Florida. FSU’s program provides flexibility and convenience for students working toward a higher-level position in their current workplace. The second year of the program requires 90 clinical hours in a healthcare setting with a preceptor. The program is 32 credit hours stretched over a total of 6 semesters. Though all courses are offered fully online through Blackboard, students must live and complete clinical work in Florida. Stony Brook University, part of the State University of New York, was founded in 1957. More than 2,500 undergraduate and graduate students enrolled in Stony Brook’s 340-degree programs. The Master of Science programs are available through Stony Brook’s School of Nursing. Online degree options include Mental Health, Nursing Leadership, and Nurse Midwifery. Each program requires the completion of either 36 or 45 credit hours. Applicants must also have a Bachelor of Science in Nursing, 3.0 GPA, one year of experience in nursing, and a Registered Nurse license. Being the medical branch of the University of Texas, this school offers a number of MSN programs including Adult/Gerontology Acute Care Nurse Practitioner, Adult/Gerontology Primary Care Nurse Practitioner, Clinical Nurse Leader, Executive Nurse Leader, Family Nurse Practitioner, Neonatal Nurse Practitioner, and Nurse Educator, as well as Post-BSN/MSN Certificates. Students will be taught everything they need to be successful leaders in the nursing field. The school is SACS-accredited and CCNE-accredited. Tuition and fees vary by program. Please visit each program’s individual pages for a more detailed breakdown of tuition charges. The University of North Carolina at Greensboro offers two online-only MSN concentrations: Nursing Administration and Nursing Education. A third option, an MSN/MBA in Health Management, is offered in partnership with the UNCG Bryan School of Business and Economics and is delivered in a mix of online and on-campus classes. Students in the Nursing Administration program are required to complete 37 semester hours and 504 clinical hours, which are included in the coursework. Students in the Nursing Education program are to complete 38 semester hours and 210 clinical practicum hours. The MSN/MBA in Health Management is a dual degree that requires 62 semester hours and 504 clinical hours. Gardner-Webb University, located in Boiling Springs, North Carolina, started in 1905. Over 4,500 students currently attend the school with over 60 different fields of study available. The Master of Science in Nursing offers two online programs. GWU offers specializations of MSN in education and administration. Both programs require a Certified Nursing License. The programs require between 30-36 credit hours. There are currently less than 300 students in the program, allowing for a high student-to-teacher ratio. At the moment, Georgia College offers three MSN majors online: Family Nurse Practitioner (FNP), Family Nurse Practitioner with a Concentration in Psychiatric Mental Health (PMHNP), and Nurse Educator. They also offer a Post-Master’s Certificate for nurses who already have their MSN degree and want to seek their certification as FNPs, Nurse Educators, or Psychiatric Mental Health NPs. Students in the FNP program will learn to provide advanced care for whole families. The course studies combine theoretical background with evidence-based clinical experiences. Students in the PMHNP program will be prepared to provide mental health care in a number of healthcare settings. There is a shortage of psychiatric and mental health care providers in Georgia, making the employment search a non-issue for qualified graduates. Students who are passionate about teaching and nursing should consider the Nurse Educator program, as it prepares them for educational roles in academic and clinical settings. The program focuses on the essentials of MSN practice along with teaching techniques and instructional strategy. Georgia Southern University offers an online MSN degree with a concentration in chronic care management. Graduates of the program will be able to evaluate chronic care conditions with a focus on those affecting clients of managed care eligibility. Students of the program will be able to meet the CMS criteria for chronic care management reimbursement services, develop chronic care management resources, and build a network partnership throughout healthcare service networks. Students will be required to complete 26 credit hours, which includes 270 applied clinical hours and can be completed in one year of full-time study. Ball State University, founded in 1917, is a public research university located in Muncie, Indiana. The university enrolls nearly 22,000 students. BSU offers more than 140 graduate programs. The Master of Science in Nursing is offered online at BSU with specializations in administration, education, and as a family practitioner. The duration of the program spans two years with just over 30 credits. Applicants must have certified nursing licenses and have a 3.0 GPA. The program provides everything needed for the clinical work required allowing students to participate from home. The school allows a period of up to six years for completing one of the MSN degree programs. Allen College believes in a holistic approach when it comes to their nursing programs, taking into consideration the uniqueness of each individual. The school provides a number of MSN tracks including Leadership in Health Care Delivery, Nursing Education, Community/Public Health Nursing, Leadership in Health Information Technology, Nurse Practitioner Tracks, and combined programs in Community/Public Health Nursing and Family Nurse Practitioner. The Nurse Practitioner MSN track has a variety of concentrations as well: Family Nurse Practitioner, Adult-Gerontology Acute Care Nurse Practitioner, and Psychiatric Mental Health Nurse Practitioner. Ohio State University, founded in 1870, now is the third largest university campus in the United States, covering more than 16,000 acres. All of OSU’s colleges enroll over 65,000 students. As one of the most recognized universities in the nation for its sports and academics, the nursing program ranks as one of the highest in the nation as well. Online programs in Master of Science in Nursing include Adult-Gerontology Acute Care Nurse Practitioner, Clinical Nurse Leader, Nurse-Midwifery, Pediatric Nurse Practitioner – Primary Care, and Women’s Health Nurse Practitioner. Ohio State University College of Nursing is authorized to enroll online students in many U.S. states. Based on certain laws, some states may not be eligible to complete the program. Requirements may include a professional licensure or certification to practice in the field of the program. The University of Cincinnati offers two MSN programs: a traditional MSN program and the Accelerated Direct-Entry MSN Program. The goal of their traditional Master of Science in Nursing degree program is to prepare nurses for advanced practice roles in a multitude of healthcare settings. Students are required to be nurses with a Bachelor of Science in Nursing (BSN) and have experience as an RN before applying to the program. The Accelerated Direct-Entry MSN Program is for students with a bachelor’s degree in a field other than nursing. Students in this program can earn their MSN degree in only five semesters and become licensed registered nurses. The Master of Science in Nursing program at Frontier Nursing University allows students to not only become a top-tier nurse but also gives them the option to earn a Doctor of Nursing Practice (DNP) degree at Frontier Nursing University without having to apply a second time. If a student wants to complete their DNP degree at a later time, they have that option as well. Students can choose different tracks and focus on becoming a Certified Nurse-Midwife, Family Nurse Practitioner, Women’s Health Care Nurse Practitioner, or Psychiatric/Mental Health Nurse Practitioner. Full-time and part-time options are available, with coursework being delivered online and on-campus visits being required only two or three times, depending on your program. The University of Missouri-Kansas City offers an online MSN degree program with a number of different track options, all starting at different times. Most track options start in the spring and summer terms including the Adult-Gerontology Nurse Practitioner, Family Nurse Practitioner, Pediatric Nurse Practitioner, Psychiatric Mental Health Nurse Practitioner, and Women’s Health Nurse Practitioner. All of these tracks take 53 credits to complete. Students interested in the Nurse Educator track can get started in the spring term and fall Semester and takes 41 credits to complete. The Neonatal Nurse Practitioner track takes 45 credits to complete and starts in the summer term. While the coursework is mostly online, certain classes may require scheduled online class times and on-campus residencies will be required during the online programs. Midwestern State University offers two online majors with an MSN degree: the Family Nurse Practitioner Program and the Family Psychiatric and Mental Health Nurse Practitioner Program. The programs allow students to meet the requirements for advanced practice nursing and makes them eligible for National Certification Examinations. Students in the FNP program currently have a 100% passing rate for the NCEs and all students in both programs find employment before graduation. 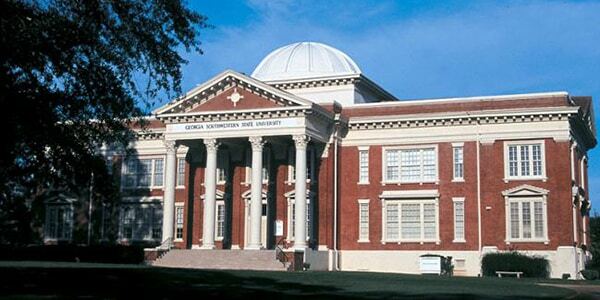 The University of West Georgia, located in Carrollton, 45 miles from Atlanta, was founded in 1906. UWG is a public school with over 10,000 students. UWG offers over 80 different areas of study. The Master of Science in Nursing is an online degree that has two different role options including education or health systems leadership. Admissions are open in the fall. The program can be finished in 2 years as a full-time student or 3 years as a part-time student. As a result, the MSN program pushes students to focus and apply research concepts, theories, and skills from their bachelor’s program. Frostburg State University offers an online MSN program, which helps students complete their degrees in two years. Practicum hours will need to be done on-site but will be scheduled to take place near the student’s home. The program is based on the American Association of Colleges of Nursing proposed Essentials of Master in Nursing Education. Graduates will have gained knowledge and skills in the areas of leadership, quality, finance, evidence-based nursing practice, complex healthcare systems and populations, advanced practice nursing roles, and many more. The program is open to all BSN nurses who meet the criteria and can be delivered in both a full-time and part-time format. Kennesaw State University offers two MSN degree programs: the Leadership in Nursing program and the Family Nurse Practitioner program. The Family Nurse Practitioner program is offered as the WellStar MSN Primary Care Nurse Practitioner degree and helps nurses become experts in the field of primary care. The program has close ties with community-based agencies and has a heavy emphasis on precepted clinical experiences. The Leadership in Nursing program offers two advanced degree tracks that build on the experiences of registered nurses: Nursing Education Leadership in a Digital World and Nursing Administration and Transformational Leadership. The Nursing Education Leadership in a Digital World is meant to help experienced professionals practice in a variety of leadership positions and focuses on ethics, information technology, resource allocation, and other areas. The Nursing Administration and Transformational Leadership track will help students be leaders in a number of healthcare institutions and agencies, especially in the areas of nursing leadership and healthcare administration. Wilkes University is a private institution in Wilkes-Barre, Pennsylvania. WU offers many different online programs for nursing, and the school has online programs for many different undergraduate and graduate degrees. The Master of Science in Nursing online program includes many different specializations. The specialties include Adult-Gerontology Primary, Care Nurse Practitioner, Family Nursing Practitioner (F.N.P. ), Nurse Executive, Nursing Education, Nursing Informatics, and Psychiatric/Mental Health Nurse Practitioner. To apply for a program, applicants must have a Registered Nursing License. Also, applicants can complete the programs full-time or part-time. The admissions deadline for the applications is rolling. Angelo State University offers an online MSN degree with two areas of specialization: family nurse practitioner and nurse educator. If the course objectives are met, students can usually complete their clinical requirements in their city of residence (as long as it’s within the state of Texas). The Family Nurse Practitioner Program is designed for nurses with a BSN that want to develop their skills in an advanced practice role. Students will become Advanced Practice Registered Nurses (APRNs) and provide primary care across a patient’s lifespan, emphasizing disease prevention and health promotion. The Nurse Educator Program is designed to help nurses develop their skills as advanced-level nurses in a teaching role. Graduates of this program serve as faculty members in teaching hospitals and nursing schools, preparing the next generation of nurses to be effective at their jobs. George Washington University is a private institution in Washington, D.C. The university also has a second campus at Mount Vernon and the Virginia Science & Technology Campus. Ten schools and colleges comprise GWU, with more than 10,000 undergraduates and nearly 15,000 graduate students enrolled. The Master of Science in Nursing degree available online has several different options to emphasize. Of those, some notable ones are Adult-Gerontology Acute Care Nurse Practitioner and Nursing Leadership and Management. The MS in Nursing is typically for professionals who already have a bachelor’s degree and are looking to expand their expertise in nursing. Students also have the option for RN-BSN. The program allows students to earn a Bachelor of Science in nursing in four semesters, and an MSN degree in three years. Unique specialization fields, including family nurse practitioner, adult-gerontology primary care nurse practitioner, nurse-midwifery, and nurse coaching and leadership are available for MSN. Sacred Heart University offers a direct entry MSN degree online – no BSN or GRE required. However, students will need at least a diploma or ADN plus a bachelor’s in any area. Graduates will be taught the skills and knowledge needed to thrive in the fields of nurse management, nurse education, and nurse leadership. Each program takes a different number of hours to complete, but they’re each worth it. The school offers four MSN programs: the Clinical Nurse Leader program, the Nursing Management and Executive Leadership program, the Nursing Education program, and the Family Nurse Practitioner program. Students have up to the middle of the program to declare which specialization they want to focus on, which gives students plenty of time to consult faculty and make up their minds. Norwich University, located in Northfield, Vermont, offers online MSN programs that provide nurses the knowledge and skills they will need for leadership or administrative positions. The online program offers two different emphases for the nursing program: administration and education. In the program, all coursework is completed online in 18 months. Also, Norwich conveniently offers four starts per year (March, June, September, and December). Classes have a maximum of 15 students, making it convenient for students to interact with faculty and staff for any questions. The University of Southern Mississippi offers two mostly online MSN programs in the College of Nursing: Family Nurse Practitioner (FNP) and Psychiatric Mental Health Nurse Practitioner (PMHNP). Both programs are designed to prepare students to provide great care for patients across their lifespan. Students in the MSN program will be required to complete 44-47 credits throughout five semesters of full-time study, including summers. However, both full-time and part-time study is available. Graduates of the program are eligible for APRN Board certification from the American Academy of Nurse Practitioners (FNP) or the American Nurses Credentialing Center (FNP or PMHNP). The program for both emphases is mostly done online, with clinical requirements being completed in the student’s own community. Johns Hopkins University is located in Baltimore, Maryland, and has been a leader in teaching and research since its commencement in 1876. Over 20,000 undergraduate and graduate students attend the university’s nine different schools. John Hopkins’ Master of Science in Nursing online program is an MSN health systems management track. The program’s curriculum covers courses, including program development and evaluation in health care, that provide essential skills in health care administration. Students benefit from resources provided by the School of Nursing’s research centers, including the centers for Cardiovascular and Chronic Care and Innovative Care in Aging. Applicants to the program must have at least a 3.0 GPA and Maryland RN licensure. Georgetown University, located in Washington D.C., is a private institution with over 10,000 graduate students and 17,000 undergraduate students. The Georgetown University School of Nursing & Health Studies offers an online MSN in a clinical nurse leader specialization for pre-licensure students, family nurse practitioner, and women’s health nurse practitioner. Some specialties require minimal on-campus visits and clinical experience in the student’s state of residence. Applicants must have at least one year of work experience in nursing, and all candidates must have a valid nursing license in addition to other admissions requirements. Online students can earn the degree on a full-time or part-time basis, completing the required credit hours over the course of 23-27 months. Samford University is a historic campus located in Alabama. The school offers 30 undergraduate and graduate degrees. The Master of Nursing program at Samford has a focus on nurse anesthesia. The program is a 28-month, 82 credit course of study. Also, SU offers doctorate degrees in nursing practice such as family nurse practitioner, health systems administration, and starting May 2018, nurse anesthesia. Requirements for admission include at least one year of experience as a Registered Nurse, licensed as a nurse, cumulative GPA of 3.0, and a few standard application requirements like on-site interviews, references, and Bachelor of Science in Nursing. Students at Concordia University Irvine can choose from one of two MSN tracks: the Nursing Leadership track and the Nursing Education track. The school has three main values when it comes to nursing education: caring, compassionate, and competent nursing care. Using this philosophy, students in the nursing program will become effective leaders and educators in the nursing field. Students can generally complete their degrees in 15-20 months. Classes can be delivered either in a fully-online format or a blended format, depending on the student’s needs. Students who maintain continuous enrollment are eligible for a $6,000 scholarship. The programs are WASC/CCNE-accredited. Duke University, founded in 1838, is one of the most famous colleges in the United States. The school was founded by Methodists and Quakers but is now a private, nonsectarian research university. Currently located in Durham, North Carolina, Duke University enrolls around 6,500 undergraduates and 8,500 graduate students. The School of Nursing and Master of Science in Nursing are some of the highest ranking online programs in the nation. The online MSN programs at the Duke University School of Nursing offer seven advanced practice registered nurse (APRN) majors and three non-clinical majors. Some of those include the family nurse practitioner and pediatric nurse practitioner. MSN students in APRN majors also have the option of adding a specialty to their course of study. The University of St. Francis offers five online program options for students seeking an MSN: Family Nurse Practitioner (FNP), Psychiatric/Mental Health Nurse Practitioner (PMHNP), Nursing Administration, Nursing Educator, and an RN-BSN-MSN option. The FNP program and the Nursing Educator track are offered completely online. The PMHNP program prepares students to be ethical managers in various healthcare institutions, such as hospitals and clinics. Students will be taught about health care law, resource and financial management, global health, and other subjects. RNs that have a bachelors degree in a field other than nursing can take advantage of the school’s RN to BSN to MSN program. Even though certain programs are offered online, students must reside in Arizona, Illinois, Indiana, Iowa, New Mexico, or Wisconsin to qualify. Georgia Southwestern State University offers four degrees and two certificates online for students seeking an MSN. The programs consist of 36-44 credit hours and prepare students for advanced practices in their nursing roles. The programs are CCNE-accredited. Students can be full-time or part-time, completing their degree in as little as two years or within a seven-year limit. Students can obtain a degree in Nursing Education, Nursing Leadership/Management, Nursing Informatics, and Family Nurse Practitioner. Certificate options are available for Nursing Education and Nursing Informatics. Duquesne University offers an MSN online degree with no GRE required. The program offers three areas of specialization: Family Nurse Practitioner, Forensic Nursing, and Nursing Education and Faculty Role. The program also has three new concentrations: Nursing Education, Forensic Nursing, and Transcultural Nursing. Students can strengthen any of their degrees, whether it’d be in Family Nurse Practice, Nursing Education, or Forensic Nursing by pairing them with any of these three concentrations. Graduates of the school will be able to enhance the nursing profession, plan, initiate, effect, and evaluate change in the healthcare delivery system, and ensure quality patient care. Concordia University Online features an MSN degree program designed for nurses with a BSN. Built on a Christian foundation, the program will provide students with the skills and knowledge needed to be caring and effective professionals. Students will be taught in the areas of counseling, bioethics, and pathophysiology among other areas. Graduates can look forward to working in a number of positions such as nurse educators, researchers, nurse anesthetists, nurse practitioners, and many others. Simmon’s College, located in Boston, Massachusetts, is a private institution that offers a broad range of different degrees online. Most of those degree programs are for graduate students. The Master of Science in Nursing online program offers one emphasis in family nurse practitioner. The requirements for the program are standard based on a need for a nursing license, at least one year as a registered nurse, and 3.0 GPA. The program can be finished in two years and allows students to complete clinicals in their home location. Delta State University provides an online MSN degree program with three concentrations: nurse administrator, nurse educator, and family nurse practitioner. Students will be able to take advantage of frequent discussion activities with other students, as well as faculty. Even though the courses are mainly online, there will be on-campus seminars scheduled throughout the program and clinical learning opportunities will take place in facilities and agencies close to the student’s home. Students at Texas Christian University have four majors to choose from when it comes to getting their MSN degrees: Clinical Nurse Leader, Clinical Nurse Specialist, Nursing Administration and Leadership, and Nursing Education. Those in the Clinical Nurse Specialist and Nursing Education major can choose from two role focus options: pediatric nursing or adult/gerontology nursing. Students can expect to complete most of their coursework online, with the major exception being the required clinical and teaching practicum courses, which will need to be supervised by nursing faculty and qualified preceptors. Practicum course completion can generally be done in the student’s geographical area but can also be completed in the Fort Worth area if necessary. Benedictine University, located in a Chicago suburb called Lisle, is a traditional Roman Catholic institution. Most importantly, students from any religion can attend. With over 6,000 undergraduate and graduate students, BU offers over 75 different degrees. BU’s online nursing program includes Nursing Leadership and Nurse Educator programs. The MSN program takes two years to complete as a full-time student. Noted on the website, 95 percent of the students said the program prepared them for their current career, and 91 percent recommend Benedictine to a prospective student. Please note, applications for Benedictine’s online nursing programs are reviewed on a continuing basis, with three opportunities each year to start courses. The Master of Science in Nursing degree at Clarkson College is one of the top-rated online nursing programs in the nation. Graduates of the program will be able to function independently and collaboratively in designing, implementing, and evaluating multiple health care strategies in a number of advanced-practice nursing roles. The MSN program is made up of four specialties: Nursing Healthcare Administration, Nursing Education, Adult-Gerontology Primary Care Nurse Practitioner, and Family Nurse Practitioner. Students in either of the Nurse Practitioner specialties will be required to make minimal on-campus visits. In their final semester, students will be required to complete a scholarly, evidence-based journal article and poster presentation based on their research from their clinical experience. Spring Arbor University offers an MSN degree online and offers three MSN programs: MSN/NP (Family Nurse Practitioner and Adult-Gerontology), Primary Care, MSN/Education, and an MSN/MBA dual degree. The MSN Nurse Practitioner program is CCNE-accredited and delivers the skills and knowledge needed to prevent, assess, treat, and manage disease – whether they be acute or chronic. The MSN in Nursing Education program is also CCNE-accredited and prepares students to take the NLN-certification exam and to become clinical leaders and nurse educators. The MSN/MBA Dual Degree program is designed to teach students to oversee clinical operations, expand services, and establish policies to ensure patients are efficiently taken care of. Spring Arbor online also offers an ADN-MSN degree path designed for nurses who want to go from an ADN to MSN instead of obtaining a BSN. Graceland University offers an online MSN degree program with concentrations in family nurse practice, adult-gerontology acute care nurse practice, and an RN to MSN program. As pioneers in distance learning, Graceland’s online program is designed to be flexible for working adults. Clinical experiences will be hands-on and will take place in the student’s own communities. Students have a number of resources available to them including faculty advisors and program consultants ready to help the students succeed in their educational journey. The Medical University of South Carolina is one of the nation’s oldest operating medical schools, since 1824. MUSC is located in Charleston and includes a medical center and six colleges for healthcare, medical sciences, and various research centers and institutes. MUSC’s College of Nursing offers online degrees in nursing and health administration from anywhere in the United States, except New York and Massachusetts. Prospective students who hold a BSN degree and nursing license are eligible to apply to the online MSN programs. Students can choose to complete the MSN degree program on a full-time or part-time schedule. Within the MSN program are three specialization options, each of which requires its particular application materials. Students can apply for fall start dates only. Idaho State University offers an online Master of Science in Nursing program that takes 43 credits to complete. A full-time program is available for students in the Nursing Education program. Students in the Nursing Education program will be prepared to teach at academic nursing institutions as well as in other related settings. Coursework will include subjects such as health policy, health assessment, and teaching and learning strategies in nursing education. Loyola University New Orleans offers a fully-online MSN degree designed to prepare nurses to enter advanced roles in the healthcare community. The school offers three paths for students looking to get their MSN degree: RN to MSN (Bridge), RN to BSN & MSN (Combined Degree), and BSN to MSN. The RN to MSN Bridge path is a fast track for students who have a diploma or associate degree in nursing and a bachelor’s degree in a non-nursing field. Students will receive a BSN equivalency. The RN to BSN & MSN Combined Degree is for the same type of students in the Bridge path, the difference being that this path will also grant students a BSN degree. Students who already have a BSN can take the BSN to MSN path and take one of three tracks: Family Nurse Practitioner, Nursing Leadership, or Nurse Educator track. Students at the University of Utah can earn an MSN degree in Nursing Education and Nursing Informatics. Students in the Nursing Education emphasis will be prepared to teach at colleges, universities, and clinical facilities as they are mentored and supervised by nursing faculty in a number of specialties. A 15-credit certificate option is also available. Students in the Nursing Informatics emphasis will gain specialized knowledge in their fields of interest as well as a broad background in core informatics content. They will carry out informatics projects under the guidance of nationally recognized faculty. Graduates of the program will have the expertise and knowledge to improve patient care by leveraging information and communication technologies. Jacksonville University was founded in 1934 as a Junior College and is now a private four-year university in Jacksonville, Florida. With a primary focus on biology, nursing, aviation, and marine science, over 4000 students can earn degrees in each. JU offers three different online Master of Science in Nursing programs. The specializations include clinical nurse educator, leadership in health systems, and informatics specialization. Each of the programs has universal access with the ability to take courses as a part-time or full-time student. The program takes 24 months studying full time. Each class has convenient 8-week sessions with six starts per year. The St. Xavier University is one of the first Catholic schools in the United States. The school was founded in 1846 and ranks as one of the top Catholic schools in the nation. Also, Xavier maintains a small student size of under 3000 undergraduates and 1000 graduates. SXU offers three different online MSN degrees for clinical leadership, executive leadership, and nurse educators. Each of the programs emphasizes the care of underserved populations and health care inequality. Applicants must have a CCNE- or NLNAC-accredited BSN with GPA of 3.0 or higher, as well as a valid nursing license and at least one year of full-time work experience. SXU only requires a short residency requirement. The nursing programs are one of the best in the nation for its nursing education and also for its graduation rates. Rush University, founded in 1972, is a private university located on Chicago’s West Side. More than 40 degrees and certificate programs are offered, as well as over 60 postgraduate training programs. The College of Nursing at Rush University allows RNs to earn a Master of Science in Nursing online to become Clinical Nurse Leaders. The program can be completed part-time in two years with a class of 15 online students. The MSN CNL program requires at least one year of clinical experience and three brief campus visits. Graduates are qualified to take the American Association of Colleges of Nursing exam to become certified as Clinical Nurse Leaders. The University of Alabama in Huntsville offers an MSN with three tracks available including the family nurse practitioner track, acute care nurse practitioner track, and the nursing administration track. Students are taught to formulate clinical decisions to manage the promotion of wellness, acute and chronic illnesses, and common health problems. Students will integrate consultation, management, leadership, and education into their clinical experiences and will be eligible to sit for the national certification exam in their area of expertise. Augusta University offers an MSN Clinical Nurse Leader Program designed to help students become leaders in the healthcare system. Clinical Nurse Leaders (CNL) are expected to show a high level of clinical knowledge and competence when it comes to patient care and serving as a resource for nursing teams. Graduates of the program will be able to apply their skills and experiences to their nursing careers, making them highly competent as advanced clinicians. If graduates are not already Registered Nurses, then they will become eligible to take the National Council Licensure Examination for RNs and the CNL certification exam offered by the American Association of Colleges of Nursing. Students at the University of Michigan-Flint can get their MSN and study to become either nurse educators or family nurse practitioners. Students in the Nurse Educator concentration will be assisted by nursing faculty as well as faculty from the School of Education and Human Services, allowing them to be qualified not only in their clinical knowledge but also as educators. Students in the Family Nurse Practitioner concentration will be under the close supervision of experienced professionals, especially as they complete their clinical practicums, which will enable them to become qualified primary health care nurses. Both concentrations are mostly completed online, with the exception of clinical practicums. The major can take from three to four years to complete, depending if you are a full-time or part-time student. Eastern Kentucky University is a public school with its main campus in Richmond and other locations in Corbin, Hazard, Somerset, Danville, Lancaster, and Manchester. Founded in 1906, EKU has over 17,000 students registered and with over 2,000 graduate students today. EKU offers six different master’s and doctorate degrees online. The following are some of the master’s degrees the university offers: Master of Science in Nursing, Rural Health Family Nurse Practitioner, Psychiatric Mental Health, and Doctor of Nursing Practice. Also, EKU offers an accelerated program for RN to BSN. Degrees take two years full-time or four years part-time. Classes start at six different parts of the year. Most courses take about eight weeks to complete. The College of Nursing and Health Innovation at the University of Texas at Arlington dedicates itself to helping students in the MSN degree program be ready for advanced functional roles in the nursing field in order to provide evidence-based healthcare to their patients. Through their Accelerated Online programs, which are offered to Texas and California residents only, students can complete their MSN degree in Nursing Administration, Nursing Education, and Family, Pediatric Primary and Acute Care, Adult/Gero Primary and Acute Care. The Nurse Practitioner option is available on-campus, as well as a Post-Master’s Certificate Nurse Practitioner program. The University of Texas at Tyler offers four MSN degrees: Nursing Administration, MSN/MBA Dual Degree, Nursing Education, and Family Nurse Practitioner (FNP). The Nursing Administrator program is offered both online and on-campus and is designed to help students assume executive leadership roles in healthcare facilities and professional organizations. The MSN/MBA Dual Degree is designed for students with an MSN that want to find a career in healthcare management and administration. The Nursing Education program is also offered online and on-campus and is designed for students who want to serve as instructors in settings such as clinical facilities, government agencies, or universities and colleges. The FNP program is delivered in a hybrid format, with on-campus classes being web-enhanced to provide a flexible and friendly format for students. Clinical hours have to be completed in Texas. Each program has a different tuition plan and cost. Please visit each program’s page to get a more detailed breakdown of costs. UL Lafayette offers an online Master of Science in Nursing degree with two concentrations: Family Nurse Practitioner and Nursing Education. The program requires that all clinical requirements be completed within the state of Louisiana. The program is offered through an affiliation with the Intercollegiate Consortium for a Master of Science in Nursing. Students will work closely with expert faculty, engage in a number of practicum experiences, and have flexible class schedules. Out-of-state students enrolled in online programs at UL Lafayette pay the in-state tuition cost due to the in-state tuition incentive. Mercy College offers a Master of Science in Nursing Administration and a Master of Science in Nursing Education. The M.S. in Nursing Administration is composed of 36 credits and prepares nurse administrators for interprofessional practice. In their final practicum course, students will put to practice the advanced nursing management principles they learned throughout the program. The program is usually completed in two years. The M.S. in Nursing Education is composed of 38 credits and prepares nurse educators for staff development positions in health care agencies and for faculty positions in associate and baccalaureate degree programs. Students can expect to learn how to use state of the art technology in developing their educational programs. Courses are offered both on-campus and online. The University of Pittsburgh started in 1787 and today consists of 17 schools and colleges with around 30,000 students, with over 500 students enrolled in fully online degree programs. Pitt’s 14 graduate and professional schools have 7,500 full-time and 2,000 part-time graduate students. Through Pitt Online, students have online access to 191 courses in seven schools. The Master of Science in Nursing offers three different online programs to its students. Pitt offers MSN specializations in Clinical Nurse Leader, Nursing Informatics, and Nursing Administration. Each program requires the completion of 36-42 credit hours, which is available as a full-time or part-time student. The average time needed to finish each degree is about two years. To determine how to rank each college, we researched and evaluated the estimated cost of tuition per credit and the graduation rate, letting each value make up equal portions of each school’s score. See our methodology page for more detail. The number of students who graduate within three years of the program determines the graduation rate, which is a necessary value to determine how successful online MSN programs are. We invite schools featured or not, to review and suggest changes or updates. Finally, please contact us if you believe your school should be on the top online MSN programs list.